Raw chunks of concrete might not be everyone's architectural cup of tea but Brutalism is in vogue right now. Cue the Brutalist London Map. One side of this handsome map provides fittingly stark details for each Brutalist gem (address, architect, date built, listing status), accompanied by a black and white photo. It's minimal yet comprehensive stuff; everything from the world-renowned National Theatre and Barbican, to the lesser-spotted Stoke Newington School and Camberwell Submarine get covered. The map itself is quite the looker; a palette of muted greys and blues with punches of red for the landmarks. And they haven't just stuck a pin where the landmarks are; their shapes are nicely outlined (revealing Barbican to be quite the concrete bastion). Unfortunately, the map's not big enough to cover a couple of the biggies; Thamesmead and Brunel University get short shrift, with arrows firing off in their general direction. Still, unlike some maps of this ilk — we're thinking in particular of a badly-aged craft beer one we've seen recently — there's a finality to Brutalist London Map; it won't go out of date unless any more of its subjects meet with a bulldozer. Which ain't going to happen... right? Usually we'd reason a relatively pricey (£8) product like this is for nerds only. 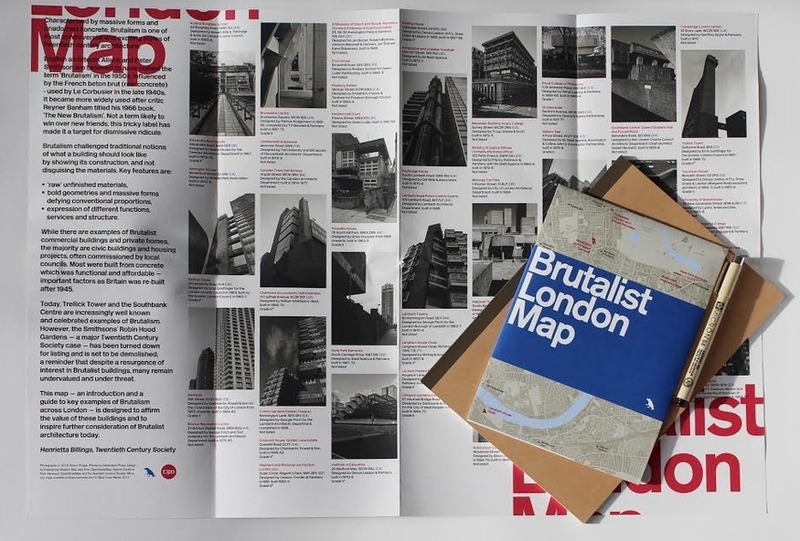 Not this one; Brutalist London Map is a key to those looking to unlock the world of Brutalism, and a pretty thing to put up in the bathroom, for those who already know their concrete onions.